We recommend Travel Guard Insurance for our clients. Day 1: Arrive Cuzco, Peru. Cuzco is the seat of the Inca civilization founded around 1100 A.D. in the Andean mountains and the oldest continuously inhabited city in the Western Hemisphere. 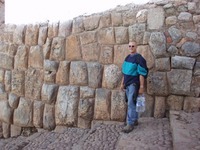 Cuzco offers a wealth of fascinating historical sites. Pre-Inca, Inca, and colonial architecture abound in this colorful and memorable Andean city. The town is nestled in a high valley over 10,909 feet above sea level, surrounded by some of the mightiest Andean peaks glistening with a mantle of ice and snow. Check into the hotel, rest, and acclimate to the altitude. Free afternoon. Enjoy a stroll through the charming Plaza de Armas. For those HIKING to MACHU PICCHU Days 3-6 see optional trip extras - click here. Day 7: Aguas Caliente to Pisac. Free morning in Aguas Caliente. Swim in the hot springs, re-visit Machu Picchu or enjoy quaint Pisac with its restaurants and shops. Afternoon train and ground transport to Pisac. The quaint town of Pisac offers a colorful market, picturesque plaza, and impressive Inca fortress ruins situated 1800 feet above the town. The incredible view here overlooks the Rio Kitamayo Gorge, the Rio Chongo Valley, and is famous for its agricultural terracing. Meals: (B).